It’s March 6th and Pacific hound’s tongue (Cynoglossum grande) has started to bloom in the Klamath-Siskiyou. This early-blooming native perennial plant in the borage family supposedly gets its name from the resemblance of its leaf shape to that of a dog’s tongue. I personally don’t think of a dog’s tongue when I look at this lovely wildflower, but the story behind the name may be a lot more interesting than it appears. Preferring to grow in light dappled shade, hound’s tongue is commonly found growing beneath Oregon white oak (Quercus garryana). 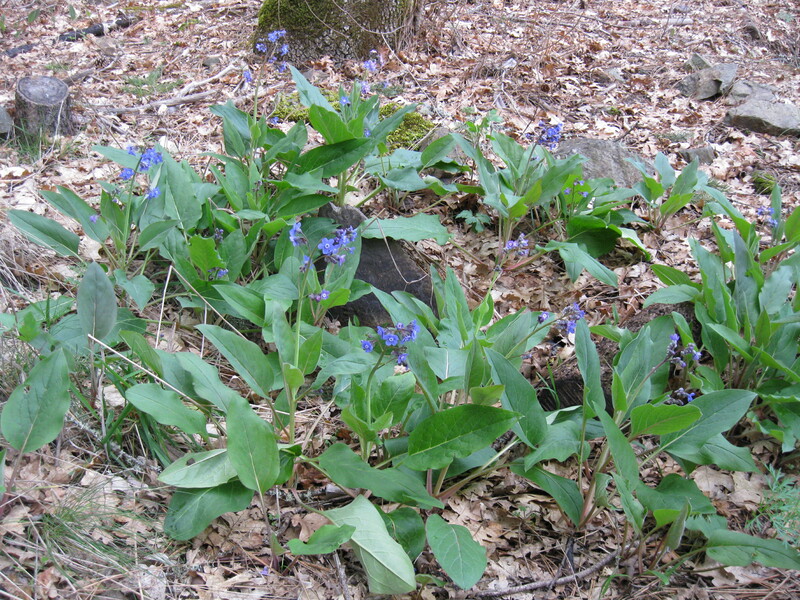 Appearing in late February to March, the striking foliage of hound’s tongue is followed by 1′-2′ flowering stalks with bold, blue flowers and white centers that resemble forget-me-nots. The uniquely intense blue flower color, with distinct white center, may have evolved to help pollinators zero in on the pollen, helping aid it’s own pollination. Hound’s tongue attracts native bees and hummingbirds and is an occasional larval host plant for moths and butterflies. Native plants that grow in dry, shady environments are not easy to find for a garden setting, but hound’s tongue is perfect for such a location. Having a large taproot, hound’s tongue does best with little or no supplemental water, but will tolerate some summer water with good drainage. After flowering and setting seed, hound’s tongue goes completely dormant in the summer, an adaptation for survival during the dry summer months. The vivid blue flowers of hound’s tongue will fade into a lovely lavender color as it gets close to setting seed. The seed has evolved hook-like appendages on the seed coat that grab onto and attach to anything nearby, including animals or human socks. This seed dispersal tactic works great and has helped the distribution of hound’s tongue. We have found hound’s tongue to be an easy plant to encourage, grow and propagate in oak woodland and mixed conifer forest on our own land. The best method we have found has been planting hound’s tongue seed into the site of a burn pile after burning debris from forest health thinning. Once the small, circular burn pile has cooled — or even if it was burned a year ago — you can seed hound’s tongue into the ash in the winter, and come spring you will have a circle of hound’s tongue sprouts! They do well in this setting that mimics natural fire disturbance, where there is little competition and wonderfully mineral-rich soil to help nourish the small seedlings. Hound’s tongue can also be seeded into containers and grown out for a season before transplanting into your preferred location, or direct sown into a dry shady spot without too much competing vegetation. Hound’s tongue ranges from British Columbia south to San Luis Obispo county in California. In Oregon it occurs only on the west side of the Cascade Mountains, except in the Columbia River Gorge. When hound’s tongue is flowering that is a sign that the morel mushrooms are also emerging from the low-elevation chaparral and oak woodland communities. Spring is on! This was a circle of ash after a burn pile on our land, but after we seeded hound’s tongue into it, five years later it is a mature stand of hound’s tongue. We have many of these on our land now, increasing the abundance of hound’s tongue already occurring on our land. These patches are now spreading on their own and have less of a circular appearance over time.